I know this reaction for myself. When I read a book from a new author that I enjoy I immediately look for more information on the author to see what else they’ve written. I got all of Ellin Hildebrand’s, Sophia Kinsella and Madeline Wickham’s book, and I realized that Sophia and Madeline were the same person, she just wrote under these pseudonyms. When I read a blog post that informs me, teaches me or stretches my mind – like Bishop Ken Carter’s blog that’s currently doing a 6 part series on Fresh Expressions – I bookmark it, to check back to read next week’s installment. not able to be refuted; inspiring conviction. not able to be resisted; overwhelming. What makes you trust the storyteller? What gives someone a compelling faith story that leaves you wanting more? Is it the integrity of the story teller? Is it the way that the storyteller tells the story? Building up anticipation? I would wager it has more to do with nonverbal – the sincerity, the vulnerability, the body language, the raw emotion, the honesty. I would also guess that you have to trust this person. It doesn’t mean you have to know the person, it just means you have to buy what they’re selling. As we were giving out free cake today at Santa Fe College, I went into the coffee shop to buy an iced drink as I do. Two of the co-workers had just gotten our free cake and they were trying to talk their other co-worker into getting a piece. He said, “I don’t trust free cake.” They said that we were a church. He answered, “I don’t trust free cake, especially from a church.” As he was taking my order and I didn’t tell him I was the pastor of the sketchy church giving out free cake. I know I highlight this multiple times a week, but when we share stories, lives together, then that’s when the real change happens. You don’t have to have had brain surgery to have a compelling story of faith. Trust me. The best stories are from the heart, when you peel back the layers and are vulnerable. Being real with people is the highest compliment you can pay, because no one likes to be bs-ed. No one likes to be made a fool of, but when you drop the masks and you KNOW and RECOGNIZE that you don’t have any control of the situation that’s where God’s love steps in and makes a way. That’s where the trust comes and the faith. It’s okay to yell at God. And it’s okay to cry out. May scriptures come to you in the midst. May songs come to you in the midst. May a friend lift you up in the midst. May you have the courage to be vulnerable and may people’s responses be more than enough…may they lift you up with the grace and mercy of God. You see, you’ve been invited into the greatest story ever told. You have your own story of redemption. You have your own story of the mountaintops and valleys. You just have to tell it. God will give you a story. God will give you the boldness, the tenacity, and the courage to speak it. Don’t be afraid. If you’re not a great speaker. Many people in the Bible and throughout time have had that same problem! God will give you the words. God will guide and lead you in all that you do and say. Tell the story. 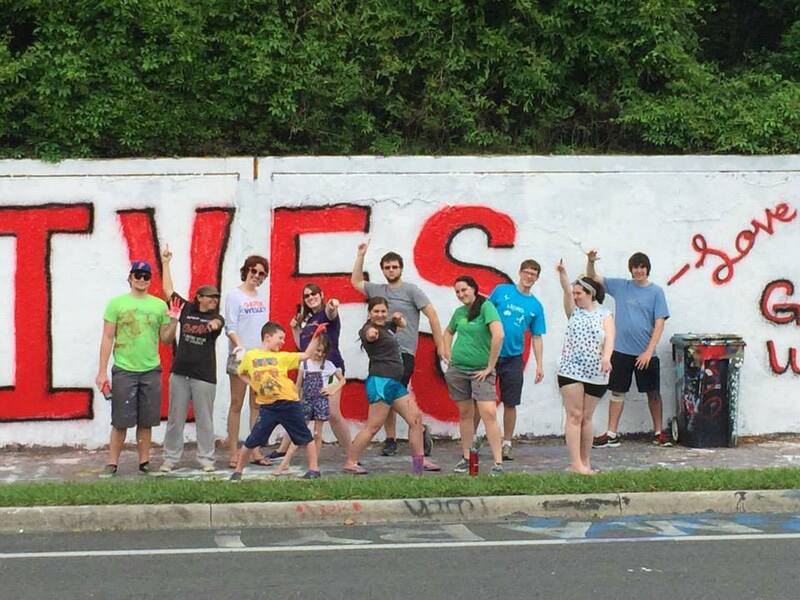 Last Easter, we painted the 34th Street Wall with the words of the last song Jake is going to sing tonight. #BecauseHeLives Tell the story. You will have a compelling one, indeed. The world is hungry for a life-giving, life-tranforming story.